Receiving a scholarship from AALL and LLOPS to attend the annual meeting this year was exciting. Not only did it help persuade the firm to send me, but I had never been to Denver before. We flew in Friday evening; that way, we could go to the PLL reception and Mort could attend Chapter President Leadership training Saturday morning. The reception included a mariachi band and margarita slushies that hit the spot. I met a newer librarian from Rochester, NY who had questions about software, serials management, databases, contracts and all that goes with managing libraries.The next day, I walked all over Denver while Mort learned about leadership. I loved the city – especially the juxtaposition of the old and the new. Sleek skyscrapers sat next to short buff-colored stone buildings decorated with fruit, faces and flower motifs. The streets were wide, and the South Platte River ran through town. A pedestrian mall stretched nearly to the river on the west end and the state capitol building to the east, lined with giant bowls of flowers. Public areas included tables for chess games and convenient access to public transportation. 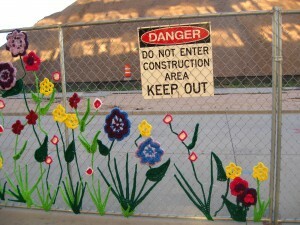 A long fence around a large construction site had been crocheted with a vast field of flowers. Pianos were scattered along the mall for the public to play. One evening, we joined a crowd listening to someone sing and play “Levon” by Elton John; another day, we listened to a pierced, tattooed and leather clad young man give a lovely performance of Pachelbel’s Canon. The Conference Center was the biggest building I’d ever been in. Center staff used Segways to maneuver through the conference center, and first aid staff drove wheelchairs powered by bicycles. A giant Blue Bear sculpture leaned against the front windows, trying to see what the people inside were doing. It was a nice touch to an enormous facility. Despite its size and the number of attendees (about 2,700), I kept running into old friends. The feel of the conference was relaxed and collegial. Classes were informative and entertaining. PLL’s Competitive Intelligence caucus underestimated interest in mining SEC filings for financial information – the room was too small for the crowd. On the other hand, the Water Law meeting room was enormous with just a score of attendees. My favorite session was one on how to respond to systemic problems by creating opportunities – the “Phoenix Factor”. Librarians on the panel had identified chronic institutional needs and created positive solutions for their libraries. One librarian designed a searchable database for reference questions using a program available at his school. At his next job, the need was the same but the technology was different. By working with the IT department, he became an expert on applications that can be used for in-house-created databases using simple, adaptable technology. It was an inspiring 75 minutes. The last evening, we attended the Matthew Bender dinner at the Denver Botanical Garden. It was so large we never got to see all the garden rooms, and it got dark about an hour earlier than we were used to. 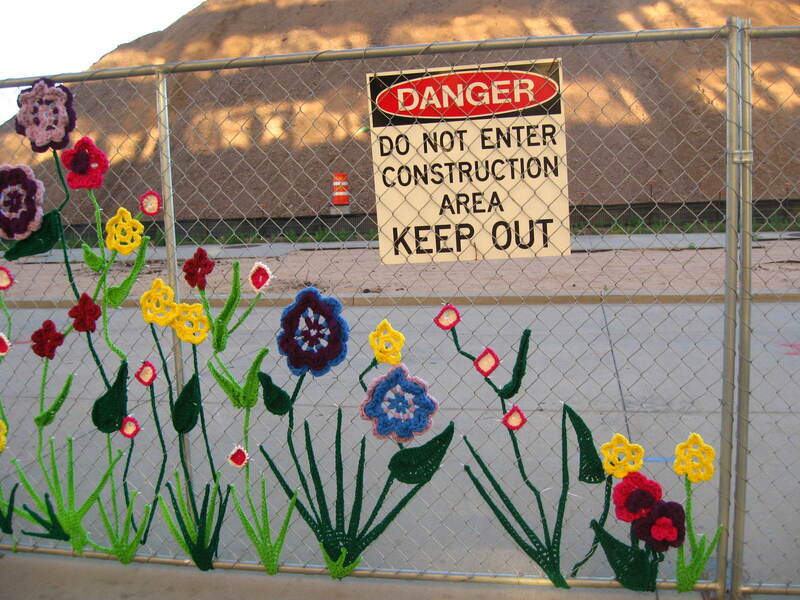 I’d like to return to Denver, and the Garden is on my must-visit list. Mort still wants to visit the New Belgian Brewery in Fort Collins. Denver was a great location for this year’s annual meeting, and I feel fortunate to have attended. Thank you to LLOPS and AALL.